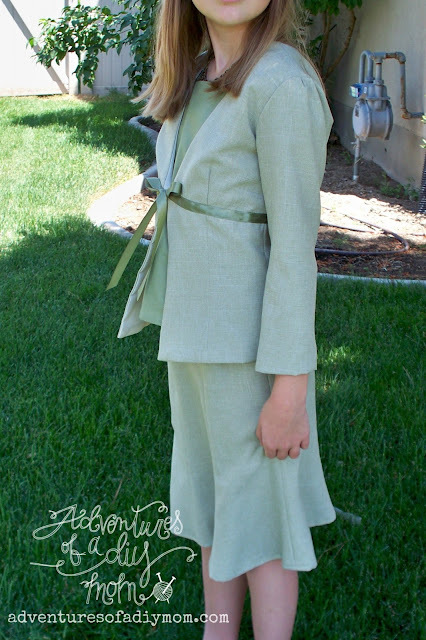 Back in May, I made this cute suit jacket, shirt and skirt for my oldest daughter. She decided she wanted to be in the Little Miss Contest in our small town. This was the outfit for the interview. She had a great experience, even though she didn't win anything. She wants to do it again next year if they have it again. I used Simplicity Pattern 4669. She helped me pick out the fabric. I really LOVE the green. I had to adjust the pattern a bit to fit her. Basically I used a smaller size for the width of the pattern, and used a bigger size for the length. I've never made anything with quite so many seams to match up, but it turned out great. She looks so grown up in it. What do you think? My friend suggested I enter it in the county fair. I think I may do just that. I'll let you know how it goes, if I do.